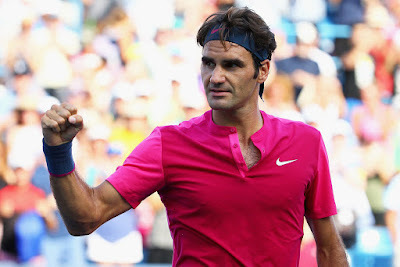 Roger Federer continued his quest for a seventh Western & Southern Open title and a return to No. 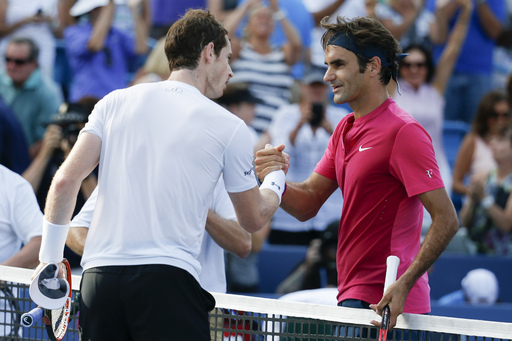 2 in the ATP Rankings, turning aside Andy Murray 6-4, 7-6(6) on Saturday. The Swiss, who sits at No. 3 in the ATP Rankings, is hoping to wrestle the No. 2 spot away from the Scot with a successful title defence in Cincinnati. Murray surged to the second position with his run to the Montreal title last week. "It would be great to win another Masters 1000, especially here in Cincinnati," said Federer who has beaten Djokovic in two Cincinnati finals. "Going for my seventh here is just great. It's wonderful to be another finalist because coming here now I'm perfectly prepared for the final. "I've been practicing and away from the game since Wimbledon. It's not that long, but in tennis terms one month is a long time. I'll give it all I have tomorrow. It's going to be tough. Couldn't ask for a tougher opponent than Novak. "Hopefully I can take advantage of the fact that I'm fresh and ready to go." Federer pounced early on Saturday, earning a quick break in the third game of the first set. He would consolidate for 3-1 and pressed for a second break with a 0/30 peek at Murray's next service game. He would eventually claim the opener in 38 minutes with a forehand winner down the line - his 14th winner of the set. 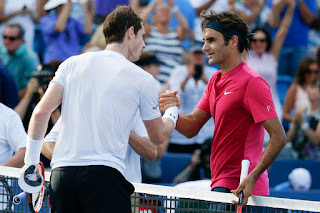 Both players would ride their serves to a tie-break in the second set, where 23-time Masters 1000 champion Federer converted on his second match point at 7/6 after grabbing the decisive mini-break with a crisp drop shot half-volley winner. He dominated the longer rallies throughout, winning 12 of 17 of nine shots or more and has now earned 35 straight service holds in the rivalry, dating back to Cincinnati last year. Federer is eyeing an 87th tour-level crown. He is a perfect 6-0 in finals in the American city. The Basel native now owns a 14-11 edge in the ATP Head to Head series against Murray, having previously dominated their lone encounter this year in the Wimbledon semi-finals. He has won the past 10 sets played in the rivalry, spanning five consecutive wins since 2014. The second seed will renew his titanic rivalry with Novak Djokovic, which is knotted at 20 wins apiece, on Sunday. It will be their fifth encounter of the year, with Federer winning on the hard courts of Dubai and Djokovic emerging in Indian Wells, Rome and Wimbledon. "I feel okay," said Murray. "I've done well to recover from some tough matches. It's good. The positive about losing today is I get the opportunity to have an extra days' rest and recovery. I need that. "I didn't feel too bad on the court. There wasn't many long rallies today, which helped. I served well, so I was able to get a lot of free points there. "Maybe the first shot after the return he was just a little bit slow there. Against Roger, he's extremely dangerous off the first shot of the rallies. A good example of that is the 5-all point in the tie-break. I hit a pretty good return and just couldn't quite get to that ball and hit a good shot there."